How about a Clean Eating Healthy Peanut Butter Cup recipe that needs only 4 clean ingredients? Well, you will never eat another unhealthy, store-bought candy bar after making these. They are so simple to make and you have complete control over the quality of ingredients that are used. Just like all S.A.D. (Standard American Diet) candy bars, they contain GMO ingredient (soy lecithin), refined salt and sugar, preservatives and dairy. They are also filled with empty calories and do not nourish the body. Also, non-organic peanut butter can contain up to 8 different pesticides. This healthier version uses clean, real food ingredients that the body can use and they’re organic, vegan, gluten-free, dairy-free and contain no refined sugar. Want more healthy dessert recipes? Check out Raw Vegan Snickers Bars, Clean Eating Chocolate Crunch Bars, Pomegranate and Dried Blueberry Chocolate Bark or my Clean Eating Cookbook with an entire chapter of 20 healthy, clean eating recipes just like this one that you will love! Tip #1: This is important – they will need to be kept in the refrigerator/freezer until you are ready to serve/eat them because they will get soft and lose their shape if left out at room temperature. 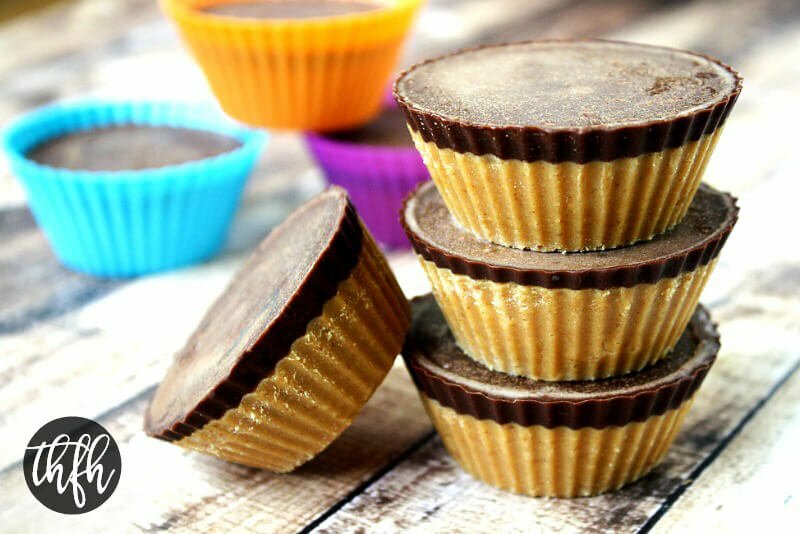 Tip #2: This recipe will make approximately 8 large peanut butter cups in a standard sized muffin cups filling them up about 3/4 full or about 10 – 12 if you only fill them up 1/2 full. The silicone muffin cups I use are easy to clean, easy to remove the treats from and they’re reusable. You can also use regular paper muffin cups if you prefer. Tip #3: Want to make these paleo-friendly or nut-free? Try using almond butter (paleo) or sun butter (nut-free) as a substitution for peanut butter. Add all the ingredients for the peanut butter bottoms to a medium-sized bowl and stir until well combined, creamy and smooth. Drop a spoonful at a time into standard size muffin cups until they are approximately 1/2 - 2/3 full. Put them in the freezer for at least 15 minutes, or until slightly hardened. Add all the ingredients for the chocolate topping to a small size bowl and stir until well combined, creamy and smooth. Remove the peanut butter cups from the freezer and drop 1-2 spoonfuls of the chocolate topping on top of each peanut butter cup, making sure you have a solid thin layer. Return the peanut butter cups back to the freezer for about 30-60 minutes, or until they are hardened. Keep in the freezer until ready to serve because they will get soft and lose their shape if left out at room temperature. 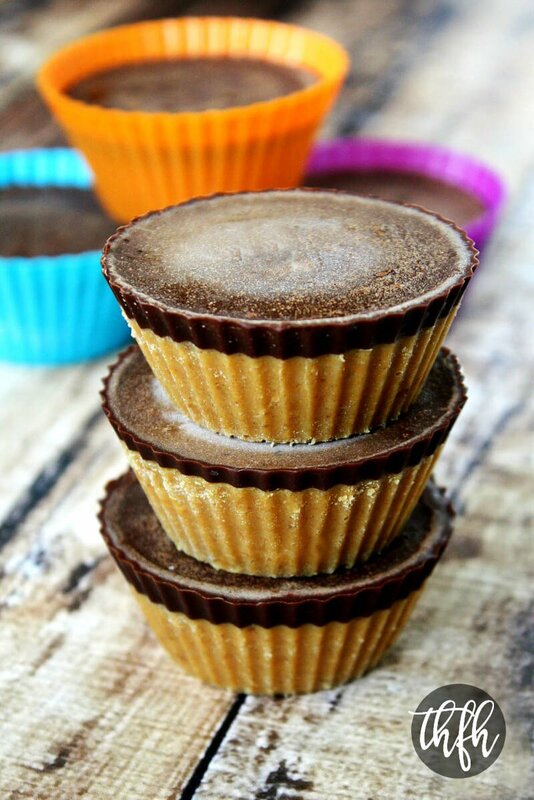 You can also make "mini" peanut butter cups using smaller muffin cups. Just follow the same recipe and distribute the peanut butter mixture and chocolate topping mixture evenly between whatever size muffin cups you are using. You can substitute the chocolate topping with 1/4 - 1/2 cup Enjoy Life mini-chocolate chips + 1 teaspoon organic coconut oil (melted together on the stove top on lowest heat). The recipe and photographs for "Clean Eating Healthy Peanut Butter Cups" by Karielyn Tillman of The Healthy Family and Home website are licensed under a Creative Commons Attribution Non-Commercial No Derivatives 4.0 International License and cannot be used without my written permission. Hi there Dee! These might not be the ideal recipe to use if you are leaving them out for more than 5 minutes or so. The reason is because of the coconut oil. When they are frozen or kept in the refrigerator, the coconut oil will harden and it’s what holds everything together in the recipe. When the coconut oil is exposed to room temperature, or +/- 75 degrees or so, it begins to melt and the peanut butter cups will become soft and lose their shape. They will also be very messy! Another alternative is to try using melted chocolate chips (I like the Enjoy Life brand) instead of the coconut oil/cacao powder/maple syrup mixture and they may hold up a little longer. It’s a shame because this recipe is a healthy alternative to the store-bought version and they are really, really good and I know they’d be a hit at your party, but I just don’t think they will make it if left out. I’ve made these a couple of times and love them! I prefer to make mini-cups for a smaller portion for my young kids and add a little extra to the chocolate portion of the recipe. Greta with maple syrup or raw honey. Thanks for putting this up on your site! Hi there Janine! I’m so glad to hear that you enjoyed them and the smaller mini-cups is a great idea for little children too! Hi there Alannah! I’m so glad to hear you enjoyed the recipe and loved your idea of using crunch peanut butter too! You’re peanut butter cups look delicious. I tried not to, but I couldn’t help chiming in about iodized salt and GMOs. Iodine salts are added to table salts because most vertebrates (including us) need them. Iodine naturally makes its way into enough food for some people, especially those who live near oceans, but are scarce inland and at high elevation. Without enough iodine, a growing child’s thyroids won’t produce critical growth hormones, resulting in cognitive and physical disabilities. In adults, lack of iodine causes goiters, which is what old-timey mountain men were hiding under their big bushy beards. The axototl salamander is a good example of iodine’s role in development. This species of salamanders lives in iodine-poor lakes and never metamorphoses into a normal air-breathing adult like most amphibians. Rather, it has adapted to become reproductive in its juvenille form. Anyway, iodizing table salt is a hugely successful public health program that has prevented a tremendous amount of morbidity in the world. About GMOs: there are absolutely ecological and environmental concerns associated with transgenic (GMO) crops, but those are rarely if ever brought up by people who are concerned about GMOs. There is so far only one case of a documented adverse health effect of GMO crops that has to do with Brazil nuts and nut allergies. GMOs like Bt- crops are highly specific and can greatly reduce or sometimes eliminate the use of broader spectrum insecticides, many of which have well documented and unpleasant mammalian health effects. The people who are at risk of dangerous exposure to these pesticides is almost never the people consuming the food, but very commonly the people that work on the farms. Migrant laborers are often put in fields to apply pesticides with absolutely no safety training or safety equipment. Monsanto is a terrible amoral company, but I think it is very important to make a distinction between the technology of GMOs and the business practices of huge unaccountable corporations. Can I use raw agave nectar instead of maple syrup? These were GREAT! I had a new brand of organic p’nut butter that was a little runny & I was unhappy with it, but mixing it with coconut oil & chilling helped firm it up nicely. I think next time I will put a little chocolate, then p’nut butter, then chocolate :-). Thanks for the recipe. Hi Melanie! I’m so glad to hear that you enjoyed them! That’s one thing I really like about using coconut oil with raw/no-bake treats…it’s the key to making them harden which is the case with these peanut butter cups. Hi Jenny! You will be surprised too that one cup will keep you satisfied. Sometimes, I even cut mine into 1/4 sized pieces and just nibble on one throughout the day. Holy moly I can not wait to try these!!! Did you mini muffin tin or regular? Also did you use paper liners or cooking spray? Thanks so much ! I’ve received feedback that the paper muffin cups work well too. With the silicone cups, you don’t have to line them with paper or with cooking spray…after they harden up in the freezer, they just pop right out. Is there any substitution for the coconut oil? my mom cant have coconut and i wanted to make these for her. Thanks! Hi Kellie! I’ve been thinking and I’m not really sure about the coconut oil. It’s mostly used to “hold” everything together after it solidifies after being in the freezer. One comment that looked interesting was someone mentioned that even though a person could be allergic to coconut, that the oil is actually different? I’m not sure if that would apply in your mother’s case. These look loverly and I can’t wait to try them. Just out of curiosity, where did you get your information on iodized salts being toxic? From everything I’ve read, it seems ok. Did I miss something? Thanks so much for the beautiful recipes. Hi Radha! Thank you for your kind comments! I’ve read somewhere a while back (I can’t remember where off hand) that it takes up to four hours for our bodies to try to eliminate the iodized salt from our of bodies because it sees it as a toxin. Basically it’s highly processed and refined and all the minerals have been removed except for two. Pink himalayan salt is unprocessed, unrefined and has 84 minerals (plus other health benefits) which is why it is my salt of choice. When I used to eat iodized salt (or eat something outside of my home that has it as an ingredient), I retain fluid very badly. This does not happen when I use the pink himalayan salt. It’s still salt though, so should be used in moderation. My first batch was the recipe from Loving Earth so I’m trying yours tonight! I cut the recipe in 1/2 and added the coacoa mixture before freezing. I then added some trader joes coconut flakes! Thanks for the recipe! Hi Jane! Adding the coconut flakes is a great idea…I might try that next time I make them! I just made these tonight and they are DELICIOUS! I used the mini paper baking cups and I got 18 total. These have such great flavor and it is nice to have a treat like this and know that it is healthy. I just ate one. I wanted a 2nd one but I realized that I was satisfied. Now I will have something to look forward to tomorrow. Have a wonderful holiday! Hi Dawn! What an excellent idea to use the smaller/mini paper baking cups…not only do you get more servings from the recipe (yay!) but you have even better portion control. I definitely find these are very satisfying and only need about a 1/2 to sometimes even a 1/4 of a big one at a time. Just keep them in the freezer and grab one whenever you need a little treat. So yummy!!! 🙂 I used honey instead of maple syrup, but they were so good! Karielyn I am so thankful that I found your Site! I think some things are just meant to be. I never really thought about juicing but I am very interested in it now. I love that I can make some of your recipes and not feel guilty. I am going to make my health a priority. Thank you for the numerous tips! Wow this is some wonderful information! Hi! Great news! I think juicing is a great place to start. I go through juicing phases but I know without a doubt that when I do juice, I eat super healthy the rest of the day so I know it would be a good incentive for you. Once you get that live nutrition you won’t crave the starchy processed foods. And after about a week or so of no processed sugar, you won’t crave that either (at least that’s what happened for me). I also have a good friend that is currently doing a 90 juice fast and she lost 30 pounds in the first 45 days. Try replacing one meal with a power juice like greens and beets with a little sweetness and will greatly benefit your health and weight loss efforts. I would recommend 24 – 30 ounces as a meal replacement because anything smaller might not keep you satisfied while you are still eating regular food. Hi Karielyn, I am new to eating healthy. I am about 20lbs overweight and very tired all the time. I am trying to change my diet but it is a struggle because of years of eating sweets. I am very interested in everything you said about eating the raw foods and healthy fats then eliminating grains and processed foods. There is so much to learn and I am overwhelmed right now. I just bought some organic peanut butter and some celery to eat as a snack. I was thinking that maybe there was something else I could do with the peanut butter and I found you! I have learned so much from just reading this page! I am going to try everything you suggest if possible. I am worried that it is too expensive to eat healthy and that I will not be able to stick with it but I am going to try. THANK YOU!!! Hi there! Wow..this just made my day! I am so excited that you are on the path to healthier eating and the organic peanut butter and celery was an excellent choice to make! You are so right about all the information being overwhelming…it still is to me sometimes. Most of the recipes on my site are to “fill in the gaps” and help when you want something sweet or to something to snack on. Try to start with a smoothie or juice in the morning, salad/veggies/fruit for lunch and/or dinner and fill in between with a healthy treat or snack if you need one. Try to eat as many “live/raw” foods throughout the day as you can. The only way I can stay on track with salads and veggies is if I have a really good dressing and then I can eat them all day. I’ve got lots of dips and dressings to help with the veggies and salads. And try to drink lots and lots of water w/lemon throughout the day. A great place to start is with juicing…have you tried to make your own juice? You can get a fairly inexpensive juicer and make your own juice at home and once you do that, the dominoes will start falling and everything else just seems to fall into place. You will feel much better, have more energy and will want to eat healthier foods. That’s what worked for me. I started letting grains sneak back in here and there (from cooking for my family) and immediately had a negative reaction. I just started eating a strict raw food/juicing plan about a month ago and lost about 12 pounds just by not eating any grains or cooked/processed foods (with hidden salt, sugar, etc). I don’t know why but that is the ~only~ way I can lose weight. Everyone is different but that is the trick for me. Try one week without any grains/starchy carbs (wheat, rice, bread, pasta, etc) and see what happens. And remember to just take baby steps…for every one bad thing you eliminate (wheat, processed salt or sugar, unhealthy drink) replace it with something healthy (coconut oil, pink himalayan salt, natural sugars, water w/lemon, etc). Don’t worry about healthy eating being too expensive. You will just need to prioritize what you buy and will also find that making a lot of things at home from scratch is way less expensive than buying a boxed version at the grocery store. It’s much better to invest in healthy foods for your health now than have to worry about health problems later. These sound great! Has anyone happened to try them with coconut BUTTER rather than oil? Hi Ciarra! I have never tried them with coconut butter and I’ve only used it a few times, but if it melts and then solidifies like coconut oil, I would think it would work, but don’t know that for sure. If you try it out, please let us know. Hi there! Super yummy! Did u figure out carbs, protein, fat Intake in 1? Hi Jenna! Even though I don’t personally keep up with calories/fats, etc, I input the ingredients in a nutrition calculator and they are comparable to the original Reese’s cups as far as calories (182), protein (6) and fat (16). These healthier ones are lower in carbs (9 vs 24) and sugar (4 vs 31). But remember, this is a healthier version and you would be eating healthier ingredients with much higher nutritional content and depending on the ingredients you used, could be 100% organic and free from GMO’s and preservatives. I think these would be a healthy occasional treat that you could enjoy guilt-free. Holy —-! These are so good. Just made them tonight. Super easy, dangerously yummy. I only had grade A syrup but I’m assuming you specified B because its somehow healthier or less refined? Hi Kaylee! That’s probably the same reaction I had when I first made them lol! They are definitely addictive! Yes, you can definitely use Grade A syrup instead of Grade B…the Grade B just has a darker color and more intense flavor. If you didn’t have maple syrup, you could also use agave nectar or even raw honey (for non-vegan). I’ve never tried granulated (or evaporated cane sugar) yet, maybe next time I make them I will just to see if that would work too. Absolutely delicious!! I used mini paper muffin tins and they turned out great…all 24 of them! :) I used organic fair trade cocoa, is that different than raw? Hi Charlotte! I’m so glad you liked them! Thanks for letting us know the paper muffins tins work good too. Yes, you can use the cocoa in place of the raw cacao. My understanding is that they are the same except the “raw” cacao hasn’t been heated over 115 degrees so it is still considered “raw”, whereas cocoa has been heated over 115 degrees during it’s processing in which it is no longer considered “raw”, but they are both “chocolate”. As someone who is a farmer I have to take offense to your non-organic rant. Most farms that aren’t organic don’t pump their animals with antibiotics, hormones or GMO grains. Antibiotics are only given when an animal is really sick, how is that any different from when you get antibiotics for a sinus infection? Most farms in America are family owned and family owned farms can’t afford hormones, GMO grains, or a ton of antibiotics. There is really no such thing as “factory farmed cows”, every farm has herd managers and people on staff 24/7 to ensure the safety and health of their animals-it is expensive to not take care of your animals-vet bills, loss in production, etc. Most of America is misinformed and uneducated when it comes to farming in America, even organic farming. You all need to do your research and seek out farmers to ask them questions rather than getting your information from the internet or the news- that can all be skewed to show a false and negative image. The very seldom is the news positive these days. Hi Sarah…I would hardly call my one-liner about non-organic milk containing antibiotics, hormones, GMO grains, etc a “non-organic rant” lol! However, I do agree with your point regarding all non-organic farms/milk do not necessarily contain routine antibiotics, hormones, GMO grains, etc. across the board – and I have revised that statement in my post. I was not referring to the small and local, family farms such as yourself. But rather milk from true “factory-farmed cows” (and yes, there is such a thing, just google it) that are mass producing milk by milking 15,000-20,000 cows at a time, pumping them with the bovine growth hormone to make them produce more milk than nature intended, CAFO’s (confined animal feeding operations), being impregnated once a year, shortened life-span and when they can no longer make milk, moving them to the slaughter house with a bulldozer because they can no longer stand or walk on their own. THAT’s the point I was trying to make and there’s a big difference. Hi! I want to know something, when you say raw cacao, you are talking about raw cacao that is the same as cacao in powder? Oh. My. You CANNOT go wrong with this treat! I added shaved coconut between the layers. LOVE IT!!! Hi Amy! You are so right..in fact, I’ve been craving a treat all day and I think I’ll go make a batch now lol. Karielyn, I had to come and tell you how much these rocked my world. A friend posted the link and I just happened to have 3/4 of the ingredients on hand. As a recovering sugar addict I was afraid to try something sweet but these were too tempting not to. I cut the recipe in thirds and just made four cups so that I wouldn’t have too much temptation on hand. Two for me, two for hubby 🙂 I subbed honey because I didn’t have maple syrup on hand. Not only were they delicious, but I didn’t feel guilty, and I dare say they were BETTER than a traditional Reese’s cup. The best part was that when I was done eating, I felt satisfied instead of wanting more–which is the problem with addictive, chemical laden sweets. THANK YOU! I am on the hunt for silicone baking cups, but couldn’t wait! I made them with If You Care paper muffin cups and they turned out great – the paper peels off easily. Hi Michelle! Yes, you can use either. I’ve never made it with agave, but it has the same consistency as maple syrup so it should work just fine. I have made it with raw honey a couple of times (the thick beige colored kind). With the peanut butter, it mixes in fine. But with the chocolate topping, it’s a little thick and you have to stir it really, really good to get it to blend in. One time I made it and the honey was very lumpy and clumped together and another time I stirred it better and it was fine. So I’ve had hit or miss success with it. However, if you were using the darker, more liquid-type raw honey, it should be fine. What about using date syrup instead of maple syrup? I’ve heard that’s better than honey and agave as well, healthwise, but would it work in this recipe? Hi Carly! Yes, you sure can. I used to use the agave until I realized it was not good and now mostly use raw honey in my raw desserts. I think I’ve even used granular raw cane sugar in the this recipe too. You just want a little something to add some sweetness so any sweetener you prefer is fine. These look wonderful. My husband will really like them too. I like your fast facts and will always take away more from your recipes. Thanks. This recipe looks fabulous and I love your website! I have been on a journey similar to yours based on the comment above and your website. I too used to count calories and obsess about everything I put in my mouth until I discovered eating whole plant based food. What I feed my family is so important to me and I’m always looking for new, creative ways to feed them healthy awesome vegan food. I absolutely love peanut butter and chocolate together. It’s my favorite combination on the planet and I will definitely be making these! Hi Karen! Thanks so much and I’m glad you’re here! It’s really nice to hear from someone else with a similar background, and especially who loves a peanut butter and chocolate combo lol! I’m making these for my coworkers on valentines day & all went well except I’m at the part where you combine the cacao & coconut oil & syrup. My cacao immediately got clumpy so I added a bit more coconut oil & it has thinned out but there are still little clumps. I don’t know what went wrong. Oh…and make sure you keep them very cool transporting them from home to work. If the coconut oil warms up to around 76 degrees, it will start to melt and they will get mushy and lose their shape. Thanks for responding! I did melt the coconut oil before mixing it and I even heated up the chocolate mixture to try to thin it out but it still didn’t work much. I was able to spoon the chocolate onto the peanut butter & chill it (although it wasn’t really pretty lol) but it tasted just fine! Hmmm…I’m not sure what else it could have been. Well, your co-workers sure are lucky to be getting a treat like this from you…that’s so sweet! I hope they enjoy it and and don’t forget to keep them chilled and as cold as possible because they will melt! I’m counting calories, would you have an estimate. These would make a nice little treat. Hi Lesa! I’m sorry…I don’t know for sure how many calories are in each treat and here’s why. When I ate the SAD (standard american diet), I ~always~ counted calories of every crumb that went into my mouth. And to no avail – I could never lose weight. It wasn’t until I started juicing, eating raw foods and healthy fats then eliminating grains and processed foods that I finally started losing weight. During a short period (40 days) when I ate 100% raw, I ate ~whatever~ I wanted, whenever I wanted and lost 13 pounds. Once my body started getting nutrient-dense, live foods with high-quality fats the weight just started falling off. For me and my body, when I eat the right foods, calories just don’t matter. That being said, I wouldn’t eat all 10 of them at one time (lol) although it is very tempting! I did input the ingredients in a nutrition calculator for you and they are comparable to the original Reese’s cups as far as calories (182) and fat (16). The healthy ones are lower in carbs and sugar. But remember, this is a healthier version and you would be eating healthy ingredients with much higher nutritional content and depending on the ingredients you used, could be 100% organic and free from GMO’s and preservatives. Hey there. I made these last week and worked out the calorie content. I only made one substitution – I used rice malt syrup instead of the maple syrup. I split mine into 10, so comes to 160 per serve. I consider that a win! Hi Emma! Thanks so much for taking the time to report back on the calorie breakdown! I’ve never used rice malt syrup but am going to have to check it out and it’s good to know that it’s another sweetener alternative that could be used. Hi! They look great! I’m wondering why there appears to be more chocolate in the middle in the picture? Did you indent the peanut butter layer? Hi there! Well, I’ve made these a couple of times and the time I made them in this photo, I didn’t actually follow my own directions (my bad!). The directions say to put the peanut butter mixture in the cups first, put them in the freezer to harden, ~then~ scoop the chocolate by the spoonful on top of the hardened peanut butter mixture. When I made this batch, I didn’t put the peanut butter mixture in the freezer before adding the chocolate so it was still soft. I added the chocolate by the spoonful to each cup and then went back to each one and spread it over the top. I think what happened is some of the chocolate from the spoonful sank into the soft peanut butter mixture leaving that indention you see. We have a peanut allergic member of the family. Can you suggest an alternative that would work in this recipe? Is raw cacao a powder or solid? I have never bought it before but all of the recipes on my “To Make” list use it in some way, but I have no clue what to look for at the co-op. Oh wow! These look great. I love all the ingredients! Will definitely be making a batch of these (may include a pinch of stevia). Thanks for sharing! Is there an oil substitute? Hi there Tiffani! The coconut oil in this recipe is what “holds” everything together, once it solidifies. I’m not sure what you could use to replace it. Maybe you could use some gluten-free chocolate chips (like the Enjoy Life) brand, and melt them to use in place of the homemade chocolate which contains coconut oil. You could try to leave out the coconut oil in the peanut butter layer, but I’m not sure if it would work.